Sometimes you will want to work on or edit a file that is stored in Swivle. This article explains how you can do that. want to update the same file in Swivle again when you are done with your changes. This can be done by downloading the file from Swivle, changing it locally on your machine and uploading it back to Swivle, whereby a new version of the original file is created. Tip: Images can be rotated or flipped directly from within Swivle, without the need to edit the file locally on your machine. Just right click the file, hover over 'Image' and select the transformation you would like to do. While you are editing a file, it is important that other users cannot make any changes to the same file. You don't want to overwrite someone else's work, but likewise you don't want anyone else to overwrite your work. To prevent this from happening, you can click the 'Check out' button to put the file in a 'checked-out' state. Checking out a file will lock it from other users and download it to your local machine, so you are free to make changes to it. 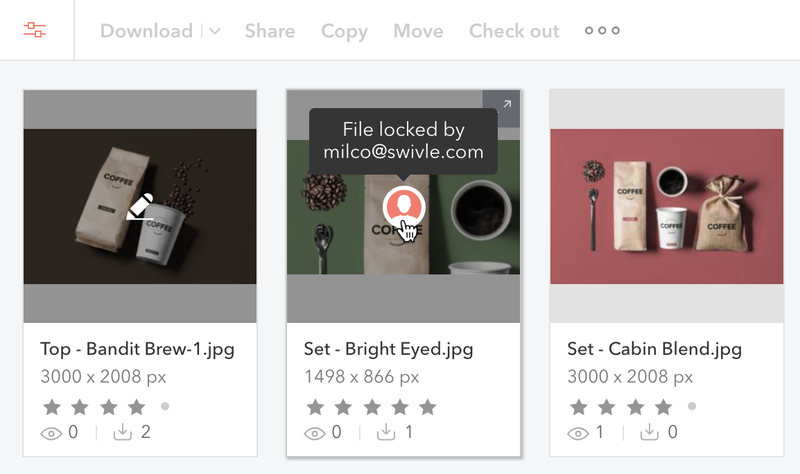 When you are done working on the file, you 'check-in' (unlock) the file which uploads it back into Swivle and makes it available for other users to edit. While a file is checked out, other users are prevented from performing most actions including also checking out, updating (e.g. the metadata), moving or deleting the file until it is 'checked-in' again. Some actions are still possible, such as downloading the original file, previewing the file, or sharing the file. Checking in a file does not replace the original file. Instead, a new version is created. Swivle will keep up to 5 previous versions of a single file. More information about versioning can be found in the Managing versions of files article. Working with Check-out and Check-in. There are two distinct ways to work with the Check-out and Check-in functionality in Swivle. The default Check-out and Check-in workflow can be used without the need for installing any additional tools, but is a little more restricted in terms of functionality. When using the classic workflow, when you check out a file it is locked in Swivle. But you will still need to browse to your downloads folder and open it yourself. Then, when you are done with your changes, you will need to manually upload the updated version back into Swivle. Recently, we've introduced a desktop tool we call the Swivle Agent. This tool is designed to integrate the Swivle Check-out and Check-in functionality more seamlessly with your workflow. In short, the agent takes the hassle of managing your files locally out of your hands. When you check out a file, it will be automatically opened in its native application. For example: a .psd file will automatically launch Adobe Photoshop. The agent will track when you save your changes to the file and show this in Swivle. Checking in the updated file is as easy as clicking 'Check in'. The article 'Working with the Swivle Agent' describes the Swivle Agent and how to work with it in more detail.